Going from Good, to Better, to Best in Your Savings on THRIVE – Become a Thrive Consultant! Here we’re gong to explore how you can MAKE MONEY with THRIVE (on top of the money you are saving by being on the Monthly Q, Smart Start, the fast track to building a Home Store, and/or Hosting a “Party”) — by becoming a THRIVE Consultant! Why would I want to be a THRIVE Consultant? 1. “Party” Commissions: 10% commission on customer orders, any extra personal orders beyond your monthly Q, AND at least a 20% commission (up to 32%) on the 1st month for those you set up on the Q — EXCELLENT! 2. Recurring Commissions: 5% recurring commission on the Q purchases every month thereafter while the customer remains on the Q — SWEET! 3. You receive a $50 ASAP (Additional Sponsorship Advanced Pay) Bonus for every Consultant you enroll — which you will receive the week after you’ve enrolled them — COOL! 4. You can be your own Host, earning Host Benefits on top of commissions — MIND-BOGGLING! 5. FREE Q Club membership, even with just a $50 monthly Q, earning you points for more free food or other Thrive products — AMAZING! 6. Build a Team: Earn up to 2% of level 1, 2, and 3 sales — AWESOME! 7. You have NO sales or party quotas — the only requirement is that you have a $50 monthly Q — IMPRESSIVE! But what if I’m not interested in having a home-based business? That’s how I joined. I was a Consultant for over 2 years, just for the extra perks for myself, before I decided to build my home-based business — so I get it! 1. You can just eat your kit! 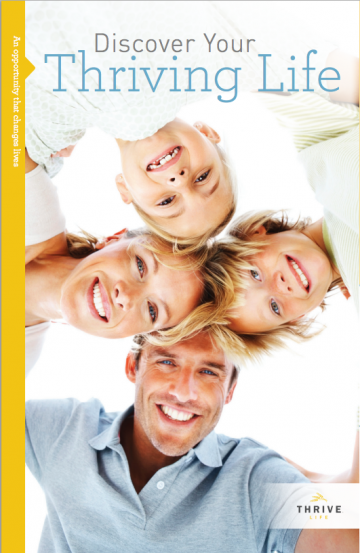 – You get loads of products in your consultant kit at a super bargain. So just eat you kit. 2. Your friends and family will think you are awesome! — You’ll get business literature with your kit, just distribute it to your family and friends who might be interested in Thrive. Should they decide to order, YOU can place the order for them and save them money — AND you’ll a little extra spending money and some free stuff, too! Pretty neat, huh? 3. Q Club is automatically FREE — no $100 minimum – that saves you $79.99 right there! 4. Get paid to do your shopping! Do your gift shopping (Birthday, Christmas, Wedding or other holiday events). As a consultant, you earn free and 1/2 off products all the time! Plus you get paid, too. Earn money from your Christmas list! – How sweet is that? 5. With NO monthly sales or party minimum, you only need a no-stress $50/month Q to be an active consultant and qualify for commissions. 6. Free food for your household! If you want a larger Q, simply set up your spouse or other household member up on the Q and the initial commission and recurring commissions will help pay for it. 7. Fast Track to building your Home Store with all the extra perks, giving you Peace of Mind! As a THRIVE Consultant, you will have additional benefits and awesome support from THRIVE LIFE. Click here to see what they provide . . . This is Great, BUT . . .
Why do I want to join the Thrive With Kay Team? Because . . .
1. I’m working on a special e-Course Online Marketing System for my team to help them build their home-based business with Online Marketing (if they want to use that). You’ll also get tips and suggestions on how to maximize all your Consultant perks to your benefit. This is in addition to the P.A.T.H. training available from THRIVE LIFE in your back office. Note: If Thrive is not your primary home-based business right now, these tips and suggestions can be applied to any home-based business. Easy Solutions to Eat Healthier. 2. 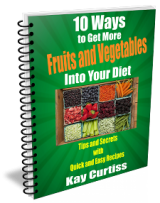 My team can use my free e-Book “10 Ways to Get More Fruits and Vegetables Into Their Diet” to give away like I do – until you get to the point where you write your own free e-Book (I’ll show you how), if you ever want to. 3. My team can use any of my free e-Courses I develop and deliver automatically via email to help filter and find qualifying leads to build their business. You would just need to do some minor tweaks to point the leads to you. 4. My team will have access to any other free products I develop (other e-Books, recipes, papers, my blog etc.) that I use throughout our marketing system. 5. As I keep learning and growing unbuilding my home-based business, I will be sharing everything I discover with my team on how to build a successful home-based business. 6. I’ll do everything I can to help you be as successful as you want to be! 3. Deluxe Starter Kit – $579.00 — gives you $1,120.49 (Retail) in Product, including the $500.45 in Food like Kit #2 PLUS a Harvest 72” Food Rotation Shelf AND a 2-Person Survival Pack. My Suggested Kit for most people is Kit #2 – the Value Starter Kit – This kit gives you the biggest bang for you buck with the Thrive food included. It’s only $90 more than Kit #1 but give you $366.68 (Retail) more in Thrive food. If you need or want a Food Rotation Shelf then Kit 3 is the best deal for you. If you have any further questions, please feel free to comment here or email me (kay@thrivewithkay.com). We can arrange a time to talk further on the phone if we need to. Finally, watch why others have joined Thrive Life and get a glimpse of the kind of people you will be rubbing elbows with! Now that you are ready to Join My Team — Click here for an easy prompt sign-up. It’s time for us to build our Thriving Lives together! This entry was posted in How to Thrive?, Thrive Opportunity and tagged Home-based Business, Thrive Opportunity on July 31, 2014 by Kay Curtiss.